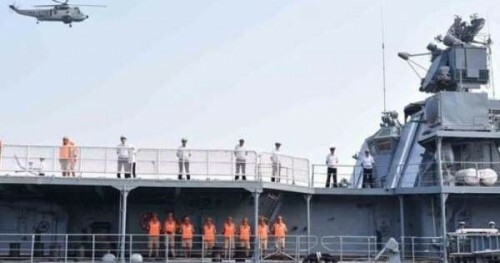 Manila, April 8 (IANS) Two Russian destroyers and a tanker docked here on Monday amid the annual Balikatan joint exercises between the Philippines and US which will end on April 12. The destroyers Admiral Tributs and Vinogradov -- classified as "large, anti-submarine ships" -- docked in Manila along with the Admiral Irkut, a "large sea tanker", kicking off a five-day goodwill visit by the Russian Pacific Fleet, the Philippines News Agency reported. It is the second time in 2019 Russian vessels docked in the Philippines. In January, three Russian naval ships docked in Manila for what was described as a visit to "further enhance and sustain the promotion of peace, stability and maritime cooperation". Russia and the Philippines are due to sign a naval cooperation agreement, likely in July, which will reportedly involve more joint training exercises and reciprocal port visits, CNN reported. The Russian warships arrival comes amid the annual Balikatan joint exercises between the Philippines and US. The drills feature over 7,500 troops, F-35B stealth fighters and include live-fire training and amphibious operations among other events. Russian Navy Captain Sergey Alantiev said that "the visit of the Russian ships emphasized the Philippines' continued pursuit of an independent foreign policy under the Duterte administration, which also includes a pivot to Asian superpower China". "Such port calls make tangible contribution to the peace and stability in the Asia Pacific region. We strongly believe that only by combining our resources and efforts can we cope with present-day threats and challenges," Alantiev said.